Anyone with a website can greatly benefit from understanding organic search engine optimization. Also called organic SEO, organic search engine optimization is a process of optimizing your website copy and HTML in order to help your website rank higher on search engines like Google and Bing. This way potential customers can find you quickly and easily. There are several measures you can take to help your website grow in search rankings. Most of them are fairly easy to do. But why take the time and effort to learn how to rank higher on search engines if you’re already using ads, social media, or email marketing? With organic search engine optimization (as opposed to pay-per-click ads) people will more easily find your website on search engines while they are looking for a product or service you provide. Making it more likely that they will convert from visitor to customer. No one searches for a product or service that they don’t want, so they’re already in the mood to buy. You just have to stand out among the competition. Additionally, when you rank on the front page of a search engine, you are showing potential consumers the legitimacy of your products or services because of your high ranking. Results don’t happen overnight – organic search engine optimization takes time, patience, and consistency. There is certainly no guarantee that you will be in the number one spot on a search engine results page, or SERP, but with this guide you will have a better understanding of how to grow your website in the rankings. Let’s take a look at 10 steps you can take to make sure potential customers are finding your website through organic search engine optimization. 1. Understand what customers want and why they might come to you. This is important before delving into the world of organic search engine optimization. Figure out the types of words and phrases, called keywords, your consumers use when looking for your product or service on a search engine. Save the terms you come up with in a list – this will be a great place to start when beginning your keyword research. It’ll be super helpful to go ahead and put your keywords into an Excel document or Google Sheet. This way, when you’re performing keyword research, you will be more organized. What are the most popular services you offer? What need does your service fill? Consider a wide array of both similar and diverse terms to get you thinking about how people are using search engines. One way to get more ideas is to type in relevant phrases into Google and look at the related searches that drop down before you search. 2. Perform thorough and diverse keyword research. This step is extremely important, and will help you figure out what words and phrases people are using to search for your products and services. There are a few things to look for when researching keywords: monthly searches, keyword difficulty, and competition. The monthly volume of searches entered on keywords can be found with a few different methods. If you have a Google AdWords account, you can use Keyword Planner for this step. If you don’t, there are a few free sites out there that will give you similar numbers. Obviously, if a keyword has higher monthly searches you’ll want to keep it in mind. However, that also might mean that it has a higher keyword difficulty, and fiercer competition. Keyword difficulty is a number that lets you know how difficult it will be to rank for a certain keyword. The higher the number, the more difficult it will be to rank on that keyword. There are a few sites online that will tell you keyword difficulty of a word or phrase. Record these numbers in your Excel document or Google Sheet that you made earlier. An ideal keyword has high monthly searches and a relatively low keyword difficulty. Once you find some keywords that make sense for your business, have a relatively high search volume and a relatively low keyword difficulty, it’s time to research the competition. However, you’ll first want to understand how local searches affect organic search engine optimization. 3. Understand localized keyword search. An important thing to note is the effect that localized searches will have on search engines. For example, say you’re in Atlanta and you’re looking for a photographer for your wedding. When you search “wedding photography” it wouldn’t be helpful to see results of photographers in Los Angeles. This is why Google takes into account where you are when you search for certain words, and shows you listings from businesses that are close in proximity to you. Many people also search specifically for services within their area. 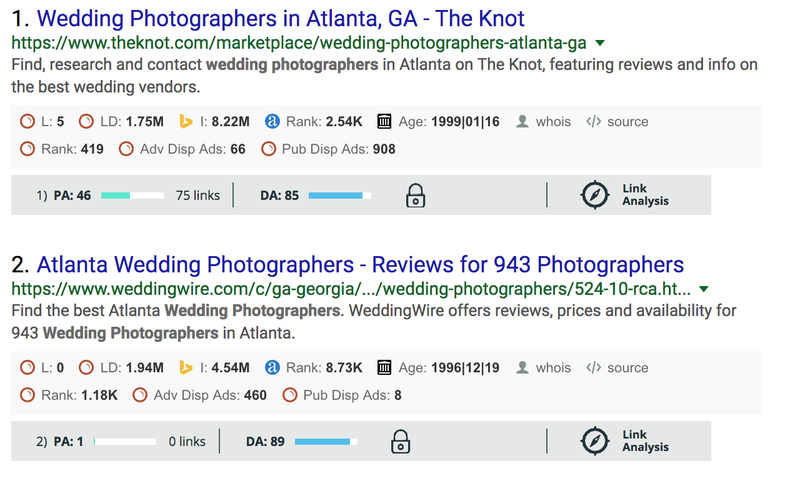 Utilizing keywords such as “wedding photography Atlanta” instead of just “wedding photography” can help you face local competition better. Setting up a Google My Business page is also a tool that will help your business pop up in localized searches. It’s free to set up, and requires a physical address for your business. Search the keywords you’ve chosen and see what websites come up. Are they using the keyword in their website copy? How many times? This will give you a clue for how many times you’ll want to use that keyword in your website copy when you start implementing changes for organic search engine optimization. One important thing to note is a website’s domain authority (DA) and page authority (PA). This is a number from 1 to 100 that indicates the strength of a website’s domain or a specific page. DA and PA are two of several factors that go into how a website will be ranked on a SERP. The higher the DA and PA, the better the chances are of that webpage ranking on the front page of a SERP (everyone’s dream!). This number is determined by a few things, such as the age of the website and number of links leading to it (backlinks). While there isn’t much you can do about how long your website has been around, it’s important to note this factor if you ever want a new website for your business. It’s more beneficial to keep an old domain and redesign the layout than it is to start from scratch. A page’s authority isn’t always the same as the whole domain’s authority, but they’re determined in the same way. New web pages on an old domain will still have the domain authority to back it up, but their page authority will start out at 1. Popularity of a website or page can be increased by upping the number of links to your page, called backlinks. Links to your pages from authoritative sites indicates popularity and trustworthiness. Find a website or browser extension that will tell you the domain authority of a URL. This way, you can accurately look at your competition and see if your domain authority can stack up to the competition, or if you need to start working on your links. 5. Implement keywords in your on-site copy. So now you have picked your keywords with the above steps in mind. Now it’s time to figure out which pages of your website you want to optimize for higher search engine results. The home page of your site is usually a good place to start. It typically holds a wide array of information about your product or service and will lead the website visitor to where they want to go. However, if you have other informative pages on your site that you think would be more helpful, you may want to choose one of those pages in addition to, or instead of, the home page. Keep in mind the number of times your competition uses the keyword you’re going for on their pages. You can find this by a simple control/command + F search on their webpage. A good rule of thumb is to have each keyword you’re trying to rank for used in your website copy at least 5-7 times per page. One practice to avoid is keyword stuffing. This is when you insert your keyword in places where it doesn’t make sense, just to have it in your copy as many times as possible. Try to write copy that makes it easier to insert your keyword rather than just trying to cram it as many times as you can into a paragraph. While you are updating your website’s copy, you’ll also want to implement changes in your HTML – specifically, in your H1 and H2 title tags, as well as your meta descriptions and URLs. You’ll want to put your most relevant keywords in these sections of your website HTML. Search engines take into account the words in these sections of your website’s HTML when listing out relevant webpages in a search result. H1 and H2 title tags are names for the two most important types of titles in your website. H1 tags are your main titles – usually large or bolded on a website, and at the top – and H2 tags are secondary titles that clarify your main title, or might be the titles to different page sections. To utilize these sections effectively, you can use the format “Business | Keyword” as your H1 tag. 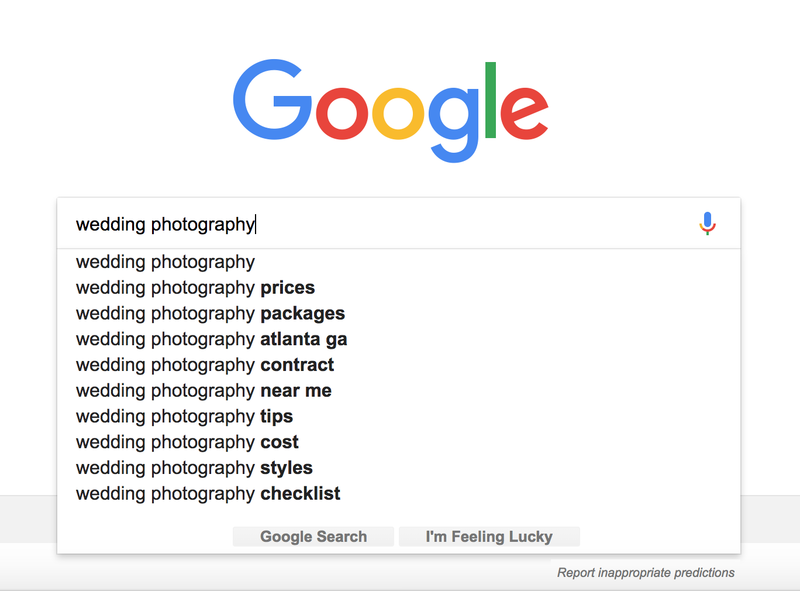 For example, if my business name was “Emily’s Images” and my keyword was “Atlanta wedding photography,” my title would look like “Emily’s Images | Atlanta wedding photography”. A meta description is a short blurb about the particular page of your website. This is a great place to insert keywords easily. However, you also want to include helpful information for potential site visitors to draw them into clicking on your website. This blurb will appear in search engine results pages under your H1 title tag and URL of your webpage. Utilizing keywords in your URLs will also help with your rankings. Unfortunately, there isn’t much you can do to change the home page URL of your website without your domain authority being reset. However, each additional page you add is a place to insert a keyword, as long as it is relevant to the actual page content. We’ll go over blogging shortly, but URLs of blog posts are a great place to use your keywords. Links are an important part of organic search engine optimization. Using the copy on your site to link to other relevant pages on and off your site will increase the number of links. Inbound links are links that keep viewers on your website. You can link to your blog posts and other information pages or service pages, for example. Search engines use links to discover new pages, as well as to determine how a page should rank, so don’t skip over this process. While inbound links are important, backlinks are just as important, but a little more difficult to acquire. We already went over how backlinks are important for building your domain authority, but the process to acquiring them can cost you hundreds. If you don’t have a budget for backlinks, try building relationships with other relevant quality websites that will link to your webpage. Writing blogs for your website not only helps with organic search engine optimization, but it provides valuable information for your potential customers and website visitors, among other things. Writing blogs about the industry you service will provide a place for you to insert your keywords plenty of times, while keeping the information relevant and helpful. On top of that, it makes your business look like an industry expert. A well-written blog makes you look more credible because of your level of expertise. Blogs that optimize for keywords will ideally be anywhere from 500 to 2,000 words, but not everyone has the time to crank out blogs that size every week. However, posting shorter blogs still provides value to your client base and potential customers. In addition to keywords, be sure to include several inbound links in your blog posts. Blogs are typically a great place to include links to your other blogs, your service pages, and more. If you want to drive traffic to your website using blogs, but don’t have the time to commit to writing blogs, hiring a full service digital marketing agency to assist you with your content strategy is the way to go. By now you’ve done your keyword research and you’ve optimized your website content to reflect the keywords you’re trying to rank for. Now you’re ready to sit back and watch your website rankings grow. How will you know if your efforts are successful? Tracking your keyword rankings is the best way to tell if your work is being rewarded. Additionally, knowing how your SEO is performing can help you make the necessary changes over time to keep your rankings high. Look around for a keyword tracking tool to help you track how your SEO is performing. It’s typical for your ranking to fluctuate from week to week and even day to day. Look for a general upward trend from month to month that shows that your efforts are successful. Implementing organic search engine optimization is a lot for one person to take on. It’s especially difficult if you’re not familiar with things like keyword research, backlinks, and HTML. Taking the time to teach yourself about SEO can be rewarding, but hiring an SEO company helps you save your time and effort so you can do the things you’d rather be doing. Contact us today to schedule a time to talk about how we can improve your organic search engine optimization.